I’ve been watching TVD and TO series lately and I’ve noticed that this series is somewhat interesting. Aside from the gross ways and unnecessary things happened it brings back so many history activities in the past. I’m quite interested with what the past was like before we have all this modern technologies. I would like to spend at least a week in the past if I will gave the chance in order for me to see and experience what it is like back then. When I received an email from the hiphop50shop.com on collaborating with them and I told myself I can finally own a vintage dress. I choose to evaluate the nice 50'sVintage Style Tea Party Dress – Black and White, it comes with red and blue however since I’ve black is quite more like 50s I decided to go with it. Black/White Polka dot dress with attached netting. 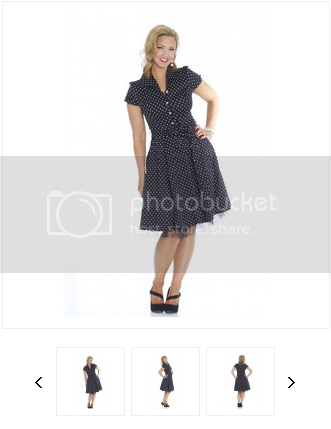 This is perfect for any 50's party and adorable enough to wear anywhere! For only $42.49. The fabric quality of the dress is very impressive, as you will notice of how fine it is. Very comfortable indeed, when you put it on, I like how it can be wear on a party or just simple event anywhere. The kind of dress I would surely keep and collect, which I’m starting to bring back the old days fashion. I also love the idea of the zipper at the side part instead of the back. The buttons they are just perfect like the dress itself. Quite heavy dress, I guess it is what it should be. Hiphop50shop has also different kinds of vintage dresses, they have the adult and children poodle dresses, petticoats, tops, shoes, and of course what would make things be more real by having the accessories that comes with the outfit. If you have a desire to feel and wear the vintage clothes, its best to check out hiphop50shop.com and see what kind of vintage dress you might have in mind. In addition, if you have a little one, you can always get one for them and you can dress up like the 50s attire together. Glad I did it; overall, my experience with the hiphop50shop is wonderful. I have a nice quality vintage dress to wear in a tea party of any occasion. You may always visit them @ http://www.50spoodleskirts.com/. On the other hand, you may follow them on their Facebook and Twitter fan pages to learn more. A disclaimer: This is NOT a sponsored post. I received the 50s Vintage Style Tea Dress for free in exchange of my honesty review. The outlook I expressed is 100% exclusively mine. Pag ka nindot, love your dress novs! Looks wonderful :) I hope I'll win! I love their vintage clothes. They make it very high quality. I miss wearing dresses because I'm usually a shirt and jeans type of girl. I like that the quality is good and comfortable to wear because that is one of my consideration in wearing a dress. Since I'm not usually wearing one, I make sure the quality is good enough for me to wear all day long. Oh... I'm on this, Novs! Remember? I am a sucker of dresses so I will join the giveaway! Lol. I love your choice! I love this flirty number! http://www.50spoodleskirts.com/50s-vintage-tea-dress-black-w-white-polka-dot-661.html Red is my color!